MANCHESTER, England (CNS) — An English cardinal has called on young people to get rid of their knives in an attempt to stem an epidemic of violence sweeping the U.K.
Cardinal Vincent Nichols of Westminster also urged young people to abandon gangs and to turn to Christ instead. 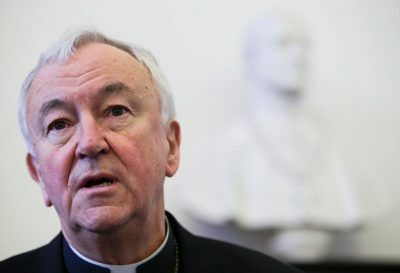 “If you or your friends are involved in gangs, try to find a way out,” Cardinal Nichols said in an April 6 audio message posted on the website of the Archdiocese of Westminster. The archdiocese operates two knife banks where people can dispose of their weapons anonymously. He made his remarks after he joined other faith leaders for the “Standing Together” rally against knife crime, April 6 in London’s Trafalgar Square. Families and communities hurt by knife crime organized the rally in an attempt to combat the worst peak in knife crime since 1946, the year that data on such types of offenses began to be collated. The Office for National Statistics revealed that over the 12 months that ended in March 2019, there were 285 “knife and sharp instrument homicides,” exceeding the previous peak of 268 in 2008. About 40 percent of the killings were in London, much of which is covered by the Westminster Archdiocese. The majority of the victims were white males, ages 16-24. Cardinal Nichols said Catholic parishes and schools also are working to address the violence, which, he said, always involved a “breakdown of relationships,” often made worse by gang and drug culture and sometimes by mental illness.